Our tour continues as we leave Segovia for Sitges. 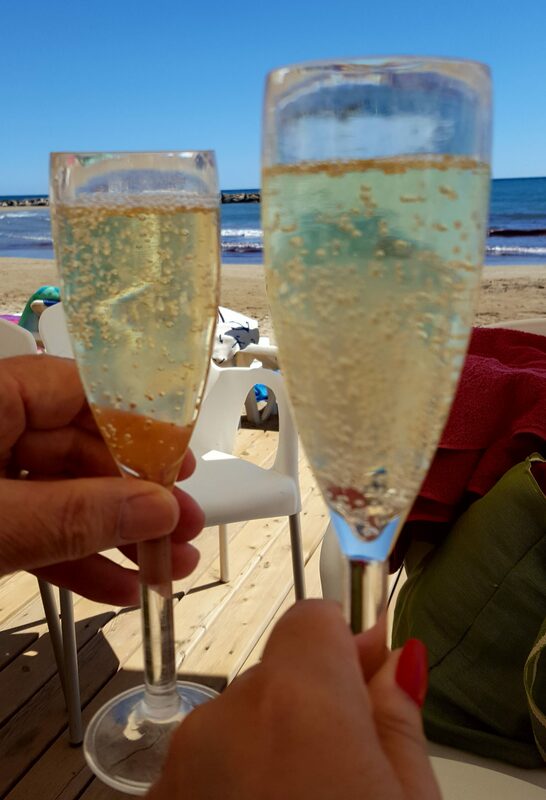 We had booked 4-5 days at The Dolce Sitges and as we are driving from Segovia they phoned to say there was an issue with our room and it wouldn’t be ready that night. However, they had booked us into the Melia on the other side of Sitges. Many apologies and a promise of a room upgrade and free dinner when we get to the Dolce the next day. Since there was nothing we could do we drove to the Melia. Bob thought he remembered how to get there from when he had lived here 15 years prior however he didn’t quite remember. The hotel is in sight but we keep finding ourselves on the narrowest streets where I am sure our mirrors are going to scratch the buildings. I tell you this not to call Bob out on it but merely because it is a funny memory to us. Last week we were walking down said street and had a laugh about it. We check in to the hotel and then drive to El Tros to see the Vacarro family. Bob had met them in 1992 when he came here to work for Kenny Roberts. That in itself was an adventure as Bob was working in Sydney, Australia, doing a job he really didn’t enjoy when Kenny phoned and asked him to come to Spain. “Sure, buy the plane ticket and I’ll be there.” He packed 2 suitcases and ended up being here for a year. During that year he spent a lot of time at El Tros and got to know the family. He was willing to eat whatever they were serving unlike the rest of the motorcycle team who really wanted American food. Unfortunately, a few years after leaving he had lost touch with them. They had no idea we were coming. To watch Marc, Marta and Ana embrace and welcome Bob back was so incredibly touching. They told us that Xavi now had Alfresco so we wandered down there for dinner. The reunion when Xavi saw Bob walk through the door is not something I will forget. I was so excited to finally meet this wonderful family that Bob had been telling me about for years. The next day we checked out of the Melia and drove to the Dolce. Wow! Our upgraded room has a view of the sea and Sitges. They treated us like royalty for our entire stay. We would end up staying there for every future trip we make. Sitges captures my heart immediately. It is such a magical place. I fall in love with wandering the streets, watching people, the shops, the food, the promenade, and the beach. I notice that Bob is different when he is here. He is happier and more at ease and talks to strangers! We stopped in a shop so that I could look at bags. There was an English couple in there and the man was attempting to try on a pair of cowboy boots and struggling. Bob walks up to him and starts to help. Seriously, who is this man and where is Bob? That sounds awful but I do not mean it that way. I know this is not something I would see him do in the U.S. so I find it quite endearing. I love to see him so happy.